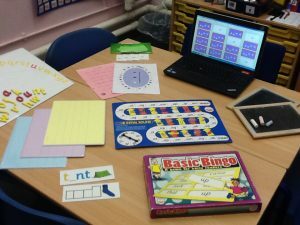 Mrs Norman works with children to give them additional support in literacy and numeracy to ensure they reach their full potential. Mrs Norman also works closely with the teachers and support staff to coordinate the support that children receive within the classroom too. What types of additional support do we provide? In Movement Group children do exercises with Mrs Norman to help their fine and gross motor skills. These are fun activities designed to engage and motivate children to participate, and include bending and stretching exercises, throwing and catching games, and lots more. The children particularly enjoy blowing and popping bubbles to help hand-eye coordination! In our ‘Clubs’, children look at a wide range of communication skills and explore how thoughts and actions can affect relationships with other people. The children share ideas and work as a team and are encouraged to support each other and to give or ask for advice. Children work with Mrs Norman, following the Alex Kelly Communication Programmes which are full of lots of fun activities, or play-based resources that support social communication development. ‘FRIENDS’ is an intervention programme designed to support children who may experience anxieties and emotional issues. It helps children to develop resilience and self-confidence through fun, nurturing activities in a supportive group situation. Trained FRIENDS deliverers are Mrs Steen and Mrs Norman. SAP is a programme aimed to support pupils’ emotional well-being and development. Mrs Duke and Mrs Martin are our trained SAP staff who deliver the SAP programme in six-week blocks.